The CEO of T-Mobile's parent company Deutsche Telekom, Rene Obermann, is planning to step down from his position at the end of next year. The news shouldn't really be much of a surprise, and given the timeline of his resignation, it's not all that sudden either. Obermann has been expressing frustration with running a large telecom for a while now, and so he has decided to step down when his current contract ends on December 31st, 2013 after 16 years with the company. Taking over the position will be Deutsche Telekom's current CFO, Timotheus Höttges, who has been with the company for the past 12 years in various roles. Höttges began in 2000 as Director of Finance and Control. He moved up to the post of Chief Sales and Service Officer in 2002, then took over the wire line division in 2006. 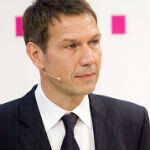 Höttges then took over as CFO of Deutsche Telekom in 2009. Obermann said that he wants the company "to go back to having more time for customers, for product development and for technology", and believes Höttges is the best person for that job. Supervisory board chairman Ulrich Lehner, had similar things to say about Höttges, describing him as a “recognized entrepreneur and has the Supervisory Board’s complete trust”. Sounds like DT will be looking into more investments in the future. Good news for T-Mobile USA! Hopefully this will bring a change in how DT treats TMO.